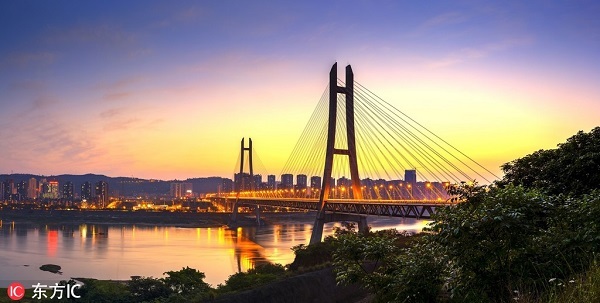 The first railway tunnel under the Yangtze River, as part of the Chongqing-Qianjiang section of the Chongqing-Hunan high-speed railway, is set to be built in Chongqing in 2024, Chongqing Evening News reported on Thursday. With a length of 265 kilometers, the Chongqing-Qianjiang section is expected to have eight stop stations with a designed speed of 350 kilometers per hour. The construction will last five years and a half with a total investment of 53.5 billion yuan ($7.7 billion). The Chongqing-Qianjiang section is a major part of the Xiamen-Chongqing high-speed railway as part of the "eight north-south lines and eight west-east lines" high-speed railway network as said in the nation's medium- and long-term railway network development plan. Targeting mainly long-distance travelers, the Chongqing-Qianjiang section also aims to serve intercity passengers. Once built, the railway section will play an important role in stepping up the poverty relief efforts in the nearby mountainous region and promoting the development of tourism along the railway line. It will also allow Chongqing to better lead and power the development of the neighborhood area and promote the urbanization drive of the localities alongside. Copyright 2018 © CHONGQING YUNENG OIL-FILTER MANUFACTURING CO.,LTD.